The IB Diploma Program is a comprehensive two-year course of study during the junior and senior year. The vision of the IBDP program is that students share a well-rounded academic experience that emphasizes critical thinking, intercultural understanding and exposure to a variety of points of view. IB is a demanding college-level course of study that leads to examinations and potentially college credit. The IB Diploma Program is ideally suited for a highly motivated student who enjoys pondering the question, Why? While many rigorous courses accelerate students through a curriculum, IB courses move at a different pace that encourages in-depth research, inquiry, analysis, critical thinking and connections across all curriculum areas. The well-rounded curriculum requires students to deal with their weaknesses in subject areas as well as their strengths. Traditional accelerated programs allow students to avoid vulnerable areas. In IB, students are forced to address them. 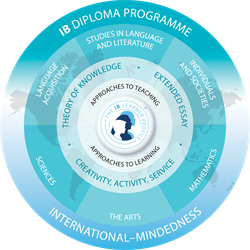 The IB Diploma Programme provides a deep, thought-provoking program of study in six areas combined with the IB Programme core elements. The strengths of the program are its academic rigor and well-rounded traditional liberal arts curriculum enhanced with an extended essay, inquiry into the theory of knowledge, research, creativity, action and service. For over 30 years, the IB Organization has shown that its students are well prepared for university work. Theory of Knowledge (TOK) explores the nature of knowledge across all disciplines and develops an appreciation of other cultural perspectives. TOK explores the knowledge within the academic subjects as well concepts embedded within the academic subjects. Creativity, Action and Service (CAS) pushes students to learn and grow through involvement in artistic pursuits, sports and community service work, fostering an awareness and appreciation of life outside of academics. CAS experiences develop a sense of awareness and responsibility to contribute in a positive, meaningful way to the local as well as global community. The Extended Essay (EE) is a research paper by which students investigate a topic of individual interest and acquaint themselves with the independent research and writing skills expected at college level. Through approximately 40 hours of work, students develop a research question, conduct independent research and evaluation of sources, and support a conclusion through use of research analysis and evaluation in a research paper. Students writing an EE are supported by an Extended Essay Supervisor and begin the process in the spring of their junior year. Complete a thorough Creativity, Activity and Service (CAS) portfolio. Complete a thorough Creativity, Action and Service (CAS) portfolio. Internal Assessments: completed in class over time, assessed by the instructor of record using the IB Assessment Criteria and moderated by external, highly-trained and IBO-approved examiners. External Assessments: including the examinations, are completed at the end of the two-year course and are assessed by external, highly-trained and IBO-approved examiners. Theory of Knowledge and the Extended Essay grading scale is A – E, with E being a Failing Condition to receive the Diploma if a student has earned fewer than 28 points. Students may earn to up 3 bonus points through their TOK and EE marks. To earn the IB Diploma, students must earn no less than 24 points from the course assessments and the bonus points possible through TOK and EE marks. For questions regarding the IB Diploma Programme, contact Chad Owen at chad.owen@mpls.k12.mn.us or (612)668-2014.